It was back to Summerhayes and Longs this week and I was travelling on my own as Janders was at Perry St today, when I pulled into the car park, thankfully there was no sign of the Tart so hopefully he’s gone into hibernation for the winter (or else he’s run out of pound coins!). 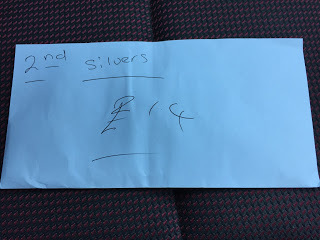 After paying my pools and a quick coffee, Ray drew the golden ball which was peg 28 and then went and picked the same peg for himself! I went in and was happy enough with peg 33 which is in a decent silvers area. 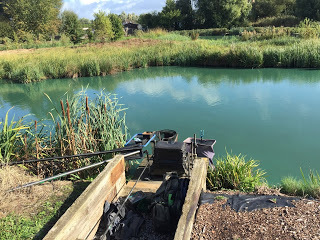 In recent weeks Roy Hughes and Jeff Sparkes have been catching some good silvers weights fishing in really close so I decided I was going to feed two lines at top two plus one along with my normal five and ten metre lines. For feed I had some micros I’d soaked the night before and for the hook I had Bait-Tech 4mm Xpands, I also had some hard 6mm pellets for banding if little fish were too much of a problem. I set up a 0.3 gram NG Mini Gimp for the inside lines and five metres and a 14 x 11 MW F1 Slim for ten metres. On the whistle I cupped in small amounts of micros on two inside lines left and right before putting in a similar amount on two five metre lines and then finally half a pot of micros on one line at ten metres straight out in front of me. I started on the short left hand line and first put in, the float sailed away and I netted a 4oz skimmer, three more between 2-6oz followed before I bumped what felt like a decent fish, then I had a ‘leaper’ around the pound mark and was off to a good start. I had some more smaller skimbobs and then an 8oz tench before another good skimmer went airborne, this one about 1.5lb. I tried the right hand line and had a couple of small fish before landing my first carp as the first hour came to a close. Back on the left hand line and the next bite resulted in a 10oz tench, I was really enjoying myself and with the best part of five hours left, I had 5lb of silvers already. It looked like Derek on my left was catching carp and Rene over on peg 12 was getting a few on the method feeder but I couldn’t really see how Ray on 28 and Jeff down on 23 were doing as I knew they’d both be fishing for silvers as well. Things slowed up a bit during the second hour, I was still catching small skimmers but no more of the bigger ones and every time I tried the right hand line I had a carp. To make matters worse, tiny roach were starting to be a pain knocking the soft pellet about on both lines. I ventured out to the five metre lines and added a couple more blades but I was missing quite a few bites and from doing really well, I was now struggling. I tried banded pellet which stopped the small fish but it wasn’t long before the inevitable happened and I was playing yet another carp! Several times during the day, I’ve struck into fish and was convinced it would be a decent skimmer only for it to wake up when I’ve got down to the top two and turn into a carp! Some of them were decent fish as well and I even had two lovely golden koi type carp with one pushing 8lb! Time was running out and I just couldn’t catch anymore quality silvers, with about 15 minutes to go, I hooked what felt like a crucian or a tench but the hook pulled out which about summed up the day. When the whistle went my final tally was 2 tench, 2 decent skimmers, 28 smaller ones and a few tiny roach which I thought might go 7-8lb plus about 15 carp. I packed up and took my kit back to the car and when Ray turned up, he said he’d struggled for silvers and Jeff said he had too and he reckoned Mark Leahy probably had the top weight with 8 or 9 decent skimmers. We walked round with the scales to start the weigh in with Rene on peg 12 and after five weighs his total was 168lb odd which set the bar really high (I have to apologise at this point as I forgot to get a photo of the weigh board so I’m a little unsure of exact weights etc! ), Mark Leahy’s skimmers went 9lb 6oz and I knew I didn’t have that and would need to beat Jeff and Ray to get second in the silvers. There were several 60-70lb carp weights and then we got to Jeff and he had loads of small fish to weigh 7lb 15oz and I knew it would be close between us. Nigel Wickham went into second place overall with 114lb 14oz and then Ray had 6lb something of silvers which just left me and Derek to weigh. My carp went 46lb odd and when I pulled my silvers net out, it didn’t feel like much and I thought I that late lost fish might be costly. I couldn’t see the scales display but a couple of people said it was close and I was relieved when Gareth called out 8lb 8oz and I actually wasn’t that far off Mark’s weight so I was right and that lost fish had been costly! Last but not least was Derek who just pipped Nigel for second when he weighed 115lb. So I sneaked second in the silvers and picked up £14 which helped pay for the day and my mini revival continues. Next week is the first match on the Isle and at the moment the river is very low and desperately in need of some rain, the bottom end is also very weedy although I’ve always preferred the upper sections early on as I think the fish are in the shallower, more oxygenated water but wherever we end up, it’ll be nice to be back on moving water. After my recent barren run, any envelopes are most welcome!